We have had a lot to concern us on this trip. In BC we worried about the cats and the fires. In Alberta we worried about cats and shade. In Saskatchewan, it was the Day of the Big Bugs. Also known as “Day of the Squeegee”. I regret I have no good pictures for you of all the bugs smashed on the windshield. My most sincere apologies for that lack. We woke on Day 3 happy in the knowledge that we were going to Calli’s for breakfast. She fed us a feast!!! The most delicious pancakes I have ever had in my life – ricotta pancakes with orange zest. Also – sensational coffee. She said it was a BC company called Kicking Horse. I really hope I can find that online or I’m making Honour move back to Delta and mail me coffee. Hmmm. Honour has just informed me that she won’t oblige (oh and so what else is new). Oh Clair……. 🙂 Not only did Calli feed us magnificently but she took all the animals’ bedding and washed it!!! We’re not sure if Fergus, Duff and Jamie cared but Honour and I were thrilled. I also got to use the wifi and managed to do the prior tl;dr post. I also got to wear my tiara for breakfast! We had much fun chatting with Calli and her husband. Calli has 2 fantastic dog sculptures in her front yard, made by the daughter of a neighbor. My photos do not do them justice but they are truly magnificent. Calli and her husband also helped us plan out travel stops for the next few days. We already had a hotel reservation for that evening but they recommended we get one for the next night as well for when we stopped in Wawa. I began calling places in Wawa and every pet-friendly hotel was booked. I really hate traveling because you have to do things like make reservations. If I can’t get the reservation I want in a maximum of 2 calls I start getting very unhappy. Some might even say cranky. It is at times like that, that I turn to my travel-agent-in-the-sky. Or wherever she might be. I use ‘sky’ because of this very funny story that Honour could tell you if she would only do her own posting. But mostly she dictates to me what she thinks I should be writing. But it’s a great story about her mother and the GPS. Maybe someday she’ll tell you. ANYWAY, my TAITS is my sister. My sister not only excels at hunting down the best reservation she even seems to enjoy the process. I called her and said please please help me. She, being the fantastic sister she is, said sure. So we could finally start off again on our journey. I took a picture of Fergus and Duff and their excitement before we left Calli’s house. (In case my photo fails to capture their joy, you can notice the clean cat bed under which they are hiding.) They spend a lot of time like that. As with many parents taking children on long journeys, we are disappointed that they are failing to appreciate this great cultural opportunity we have given them. Day 3 was a lot of nothing very exciting and a lot of dead bugs. You can tell because I have almost no photos for this post. I only had 2 on-the-road pictures, and one of them was a sign I saw as we pulled out of the gas station. I’d like to point out to all of you who have asked me – well what is it you DO do? that I EXCEL at squeegeeing. Honour pumped the gas but I cleaned the windows, the headlights and the license plate. They have VERY big bugs in Saskatchewan. What we did notice, besides the bugs, was that no one else on the road appeared to be heading east. They were all going west. We wondered what they all knew that we did not. Even the trains were going the opposite direction. I finally managed to have my camera in hand when one was approaching. I don’t know why I find the trains so appealing but seeing them come with that big headlight shining made me smile. And worry because they too were heading west…..
We were booked into a Super 8 in Kenora. We’d made pretty good time and were looking forward to having a chance to have some dinner and relax before collapsing into bed. Our GPS, however, felt we needed a bit more excitement after that long bug-filled ride. She (I have named Honour’s GPS Gypsy2 – because MY GPS is named Gypsy) insisted that we needed to turn left to reach the Super 8. I was driving and refused to listen as we were on a bridge over a lake. I crossed the bridge, turned around and headed back, thinking perhaps I’d simply been slow to respond but no, now she wanted me to turn right into the lake. I didn’t remember the reservation saying anything about needing a boat and since Molly (the car, you remember) doesn’t have pontoons, we decided to ignore Gypsy2 and try to find someplace else to stop. We drove on and tried to get our phones to also cooperate and pulled into a gas station. There we learned that the Super 8 was just ahead on the left, after 2 more bridges. .
We pulled into the Super 8 and noticed the adjoining restaurant. I checked into the hotel while Honour fed the cats. I dumped everything in the room and set up my computer to charge. Honour started knocking at the door, despite the fact I had brought her her key. Her key, apparently, did not work. We figured this was no big deal since we weren’t going to be coming and going and we headed out to dinner at the restaurant. The hotel clerk had told us the restaurant closed at 11 or maybe 1 am on a Saturday night. There WERE lights on in the building. We could see people at tables. But the doors were locked. We were tired and hungry so we walked to the other door and tried that. Which was also locked. It was 9:50pm. We finally looked AT the door and saw a sign: Due to unforeseen circumstances we are closed. Okay, that really demoralized us. As we headed back around the building, we saw 4 people come OUT the door. We called to them and asked if the restaurant was open. They said they seemed to be the very last people in the building. We walked back to the hotel where the desk clerk suggested we should order pizza. We thought this was an acceptable idea AND he gave Honour a new key. We walked upstairs (there was no elevator – we needed to walk up and down 2 flights of stairs which were located at the end of the hall furthest from our room). We got to the room and Honour tried her new key. It didn’t work. I took her key thinking maybe it just didn’t like her but it didn’t work for me, either. So I took out my key and guess what – mine no longer worked either. This was even more dispiriting. I gave up and said to Honour that she and Jamie (who we’d retrieved from the car after our non-dinner) could go and get new keys because I actually had one trip down and back ahead of her and I was carrying several water bottles. Honour came back with the young desk clerk, to whom we’d gotten very attached by this point, with 2 NEW keys. He had confided to Honour that he really hoped it was the keys and not the lock because he didn’t know how to FIX the lock. Honour took her new new key and tried to open the door. It didn’t open. To his credit, the young man did NOT laugh in our faces. He simply said – you have the key the wrong way. Oooookay. In our defense – we were very very tired and hungry. Of course, by this time, it was too darn late to call for pizza. Honour and Jamie went to bed, but I, your intrepid narrator, stayed up writing a post and editing pictures. (I was not going to be this nice to you in the future). I do not think that I’m a sound sleeper but either I am or Honour and Jamie are the quietest roomies I’ve ever had. My cat makes more noise walking up the carpeted hallway than Jamie and Honour make getting up and out in the morning. The morning report on Duff and Fergus was good (I will spare you the detailed descriptions of input/output but be assured WE are monitoring these events.) We all took a relaxed approach to getting out, had a very solid breakfast in the hotel restaurant. We decided that we would take in some sightseeing on the way to Regina. As you can see, we have now begun to PLAN this trip. Up to now, our plan was “Go East”. We figured we’d fill in the details later. After Golden we figured we needed to fill in some details sooner. We have begun booking hotels in advance and deciding where we might stop and refresh & refuel. We would be going close to Drumheller, where the Royal Tyrrell Museum of Paleontology. To get to Drumheller from Calgary, you go past Horseshoe Canyon. Horseshoe Canyon is a region of the badlands along Highway 9. It gets its name from its Horseshoe shape. (I don’t want to be disrespectful, but have you noticed the lack of creativity in the naming of geography? “Delta”. “Horseshoe Canyon” “Grand Canyon” “Rockies” ) One of the descriptions mentioned that there were hoodoos in the canyon. I LOVED the hoodoos in Bryce Canyon from the first moment I saw a picture of them. The canyon is RIGHT THERE off the road. We pulled in and I got out to go to the overlook and take pictures. Honour stayed in the car, running the a/c for the cats. There was no shade and although it was only mid-morning it was HOT. I was taking pics with my camera when my phone rang. Really? Who is calling me? I pull out my phone and it’s my sister! I say “hello?? ?” And I hear “Is there a reason you are heading north instead of east??? That’s NOT the way to Regina!” I start laughing. She and my husband have been tracking me since I left the house on Monday. She knew we were heading to Regina but there I was – NORTH of Rt 1 (Transcanada Highway). I think this is extremely funny and incredibly sweet. *smile* I assured her that we were indeed where we meant to be. While I was enjoying that chat my husband appeared at their door so I got to chat with him as well. We got back in the car and headed to Drumheller. There are dinosaurs everywhere. Every store and corner gets in on the act. It reminded me of the painted cows many years ago that appeared all over Chicago – CowParade We made our way to the museum only to find a completely full parking lot. We headed down to the overflow lot – a big empty dirt/stone lot in the full blazing sun. We began to rig up shade in the car for the cats and dog. We got all the way done doing so and looked at each other, looked at the car, looked at the sun and thought – there is no way this can end happily. Then we argued about which one of would go to the museum and who would stay with the cats. “After you, Alphonse.” “No, no Gaston, after YOU”. We took down the make-shift curtains, got back in the car and headed to town, looking for someplace to eat. We got side-tracked by a visitor center where there is a VERY large dinosaur. We decided not to climb up into its mouth but did take pictures. There was a lovely green square with fountains and tables and food trucks, but dogs were not permitted. I considered trying to cram Jamie into my bag but Jamie told me that she was not really that interested in that field anyway. We walked back to the car and headed to the main street. Honour had a wonderful erudite (not) conversation with a young woman one of the stores, trying to find a leash for Jamie (whose leash is somewhere in the car) and then trying to find a place to eat. Should Honour ever decide to post a blog she can tell you the conversation, but let it suffice to say that it was not especially helpful. We decided to head out of town and as we did so we found a Subway. Honour was driving. We had to cross a major intersection to get to the Subway, and just in front of the entrance was the merging traffic making right turns to go the direction we were going. Honour, being Canadian and polite, stopped to allow the merging car to go first (even though she had the right of way. In NJ, where we are never that polite, there would have been no question as to who was going to take over that spot. 🙂 ). The merging car happened to be a police car. THEY knew the rules of the road. 🙂 As Honour stopped, trying to figure out how to cut in front of the car and enter the parking lot, the office was gesturing furiously out the window for her to GO! So go she did and pulled into the lot. The police car pulled in as well but we went separate directions. Honour went first to get food while I stayed in the car running the a/c. Of course you KNOW who was right behind her in line. 🙂 The police officers. There were several storm cells south and east of us, but we were very lucky and skirted about the edges of the bad weather. We had a little rain, but not much. We could see the dark clouds and rain in the distance and were quite happy to not have to drive through all that darkness. We glimpsed rainbows several times in the distance, as well as wind turbines. I find the turbines graceful and elegant. I noticed that many of the streams running through the fields had a lot of white around the banks; other streams had none. I can’t figure out what it might be but I’m hoping someone reading this might be able to tell me. We spent a lot of time walking about in Drumheller and didn’t see any real dinosaurs. But we’d apparently spent enough time there that we did not get to Regina and Calli until 9pm. Calli welcomed us and introduced us to the family: daughter, grandson, husband, spaniel puppy (i think it was a spaniel), 2 greyhounds and 1 Irish wolfhound. They were all lovely and welcoming. Calli made us a lovely dinner and we had a great time chatting. Calli is someone who appreciates my Ahuva-ness – she had a Disney tiara for me. It sparkled and had flashing lights. I wore it through dinner. She invited us for breakfast the next morning and we accepted. We know a good thing when we see it. The hotel was only 10 minutes from her house and we got there and parked uneventfully – no hail, no rain. It was a bit of an adventure finding the elevator up as it was around the corner from the stairs. But we were in the bowels of the building and there was no way I was going to walk up at that point. Our room was lovely, upscale and wonderfully comfortable. It was midnight and the 3 of us crawled into beds and fell asleep, happy in the knowledge that we were going to see Calli in the morning. I’m on a roll. I’ve made it inworld 2 nights in a row. I can’t remember the last time I did that. It was wonderful to see friends again! I got to Tribeca on Friday night just in time for the final wrap up – Tom Waits and Leonard Cohen. Calli played “Jersey Girl” for me – her theme song for me. *smile* I requested Leonard Cohen’s “Closing Time” in memory of Lalo. It was one of his favorite tunes for our Friday night music fest. There were other friends there as well. Saturday night I was still awake after we’d had a Big Bang Theory marathon. Everyone else headed to sleep but I wasn’t quite ready. 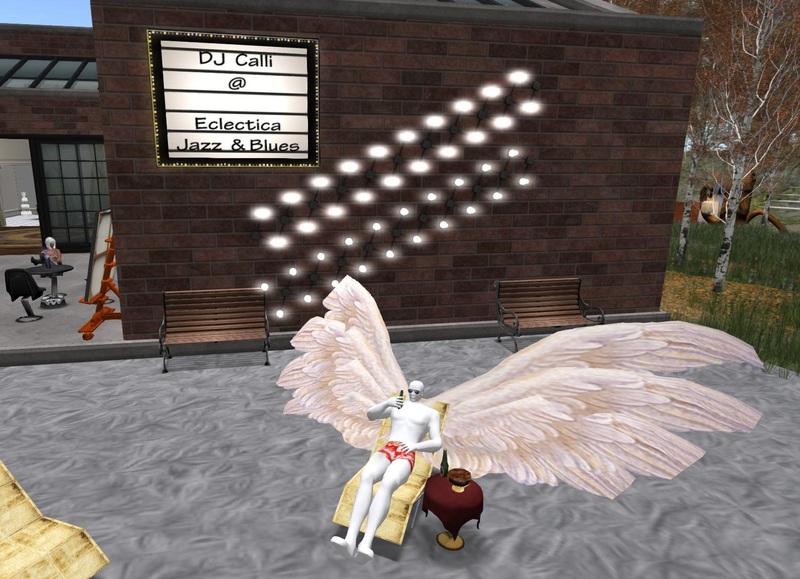 I logged in and joined the folks at Calli’s Eclectica. Winston was there!!!! Haven’t seen him in months and months. It was great to catch up. 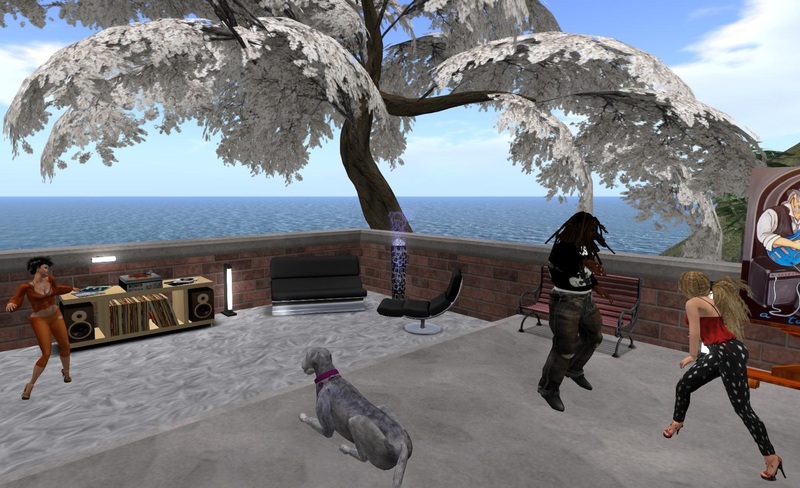 🙂 I made him get up and dance because as I told him – SL is pretty much the only place where I CAN dance these days. We’ve upped the PT exercises and my foot hurts. That’s GOOD. Hurt is good in this case, but I’m not quite ready to dance. I guess that’s the upside of long holiday weekends. 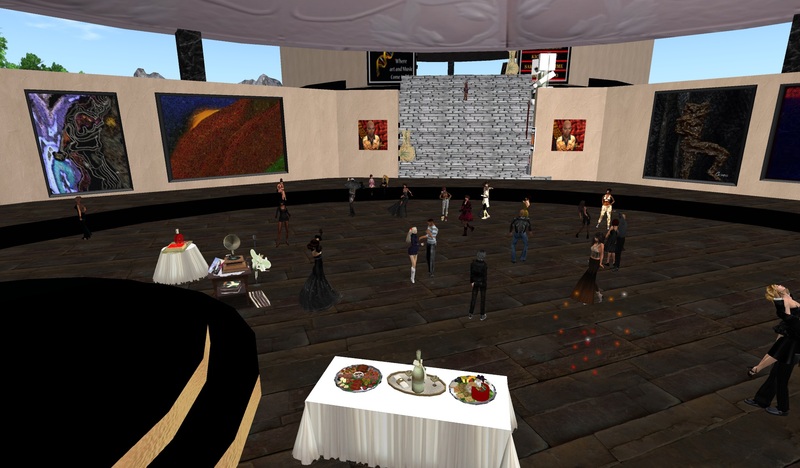 I get to sleep late or nap (because kittens don’t LIKE me to sleep LATE) and so I have energy late at night when “the gang” all start rezzing inworld. 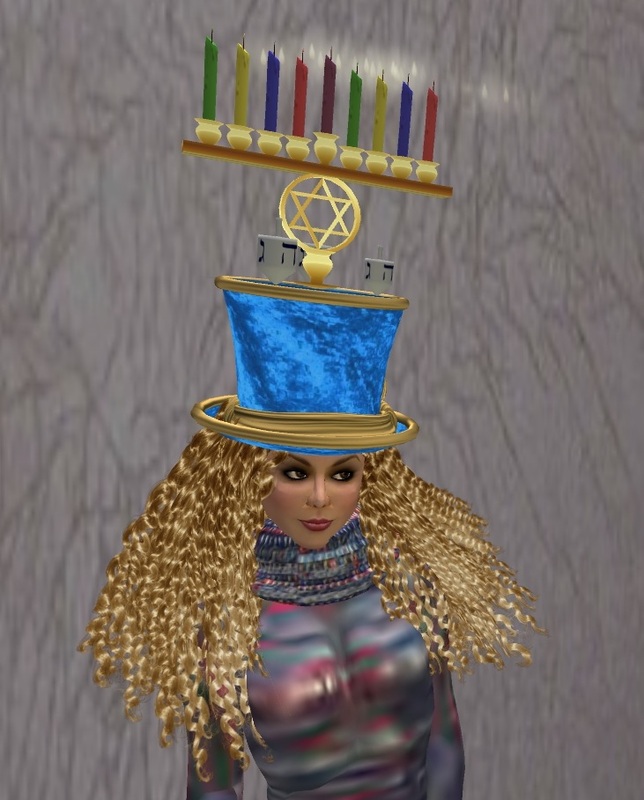 It’s also Chanukah so I try to log in each day to light my Chanukiah. Lalo made it and it is beautiful. Bamboo and I have been lighting the candles, but it’s not quite the same. 2 years ago the 3 of us lit them together. Last year I was at Lalo’s to light the Chanukiah and say the prayers together. Bamboo and I miss him very much and appreciate having his graceful elegant Chanukiah.